Geoscientist Malcolm Cleaveland examines the Messiah, an instrument purportedly made by Stradivarius. Cleaveland and his colleagues dated the wood to the violin maker’s lifetime. Malcolm Cleaveland, professor of geosciences, and his colleagues used tree ring records to accurately date the wood used in a famous violin purported to be made by Stradivarius and showed that the wood was hewn during the violin maker’s lifetime. The violin bears the name Messiah and is believed to be one of the instruments made by the famous violin maker Antonio Stradivarius. After a colorful past, the instrument landed in the Ashmolean Museum at Oxford, England. Four years ago an expert declared the Messiah a fake. The controversy escalated as a British investigator dated the instrument to the 1680s, while a German tree ring expert put the date in the late 1730s — too late to be an authentic Stradivarius. 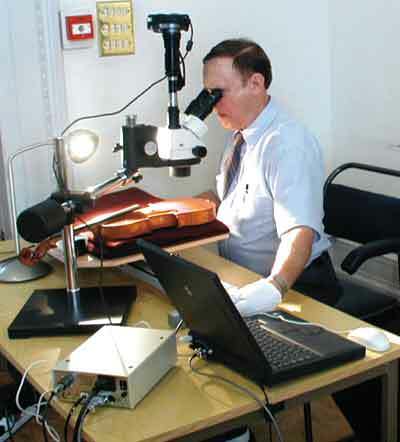 The British investigator measured the violin itself, while the German researcher measured the rings using photographs. A panel of American dendrochronologists measured the tree rings in the Messiah. The researchers brought specialized equipment to the Ashmolean, where they measured the tree rings lying beneath a coat of varnish on the front piece of the violin. The researchers compared the rings to tree ring chronologies for Norway spruce found at high altitudes in the Alps of Austria, Italy, Germany and France. They also compared the Messiah tree rings to those of another famous instrument, the Archinto, which they measured at the Royal Academy of Music in London. The Archinto, a confirmed Stradavarius dating back to 1696, had more rings for comparison — 159 versus 109 in the Messiah. They were able to determine, by comparing the Messiah to the Arhcinto and the Archinto to the tree ring chronologies, that the wood in the Messiah dates back to 1686 — during the lifetime of Stradivarius. “We can’t confirm that this is a Stradivarius, but we can say that it’s in the right time frame,” Cleaveland said.